Alex and I went to the Brooklyn Museum this afternoon to see the Ron Mueck exhibit. 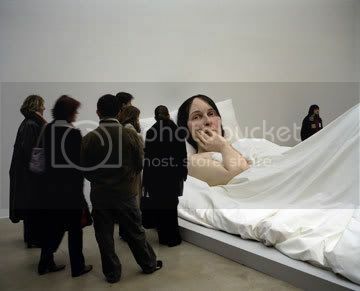 Mueck (who's Australian but lives and works in England) is what they call a "hyperrealist" sculptor. His subjects are humans, but the scale of these lifelike works, done in fiberglass and silicone, gives a different feel -- either they're gigantic or very small. His work is absolutely incredible. These sculptures look very much alive! Every sculpture is painstakingly detailed, down to the veins in the skin to the fingernails and fine lines on the forehead, and body hair (eyelashes, eyebrows, etc.). It's eerie to look into the eyes of a fiberglass "human" and see "life"! There are a couple of themes in his work. He seems to be a bit consumed with life and death... many of his subjects are very old or very young (as in newborn babies), and every subject looks troubled. 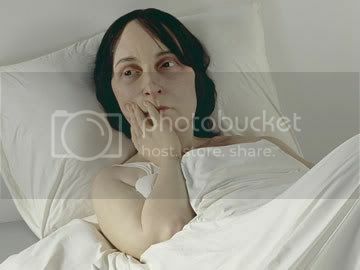 The gargantuan woman "In Bed" looks as if she has the weight of the world on her shoulders... and it's all in those (fake) eyes. Unbelievable. Mueck started out making puppets for the Muppet Show and Sesame Street, and went on to do work in movies. His work must be seen to be appreciated. Be sure to watch the video in the multimedia section of that page.